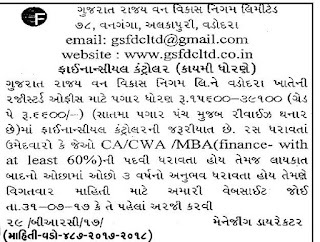 Gujarat State Forest Development Corporation Ltd. has published Advertisement for below mentioned Posts 2017. Other details like age limit, educational qualification, selection process, application fee and how to apply are given below. The candidate shall be a qualified Chartered Accountant or Cost Accountant or MBA (Finance) with at least 60% with required experience. Shall have a minimum three years of experience in a responsible position with sufficient experience in preparation of Balance sheet and handling of taxation matters in Public Sector Enterprise / Public Ltd / Pvt. Ltd. And Semi-Govt. Departments. Candidates having higher Qualifications or having more work experience may be preferred over others for the interviews. Should have knowledge and experience of Finance & Company Accounts applicable to manufacturing/trading units with sound exposure to statutory compliances, CAG guidelines dealing with Ministry as well as Government Agencies etc. Should have knowledge of Accounting / Auditing Standards issued by ICAI, scheduled II and III under the companies Act,2013, Tax Laws (Direct & Indirect), XBRL, preparation of Final Accounts, management of multi unit accounts and Audit (Internal / Statutory / Stock/ Government etc.) will be preferred. Experience in working on or implementation of ERP system will be given preference. Candidate should have knowledge of Gujarati or Hindi. The candidate should have a pass certificate of CCC+ examination conducted by the institutions notified by the Govt.of.Gujarat. Candidate should have knowledge of computer in the areas covered by CCC+ syllabus as prescribed by the Govt.of.Gujarat. The selected candidate shall be on probation for a period of two years which may be extended for administrative reasons for a maximum period of one more year, but not more than six months at a time. On expiry of the probation period/extended probation period, as the case may be the service of the incumbent will be confirmed, if his performance during the period is found satisfactory. The candidate shall also be required to give 2 years service bond equivalent to 3-month gross salary. 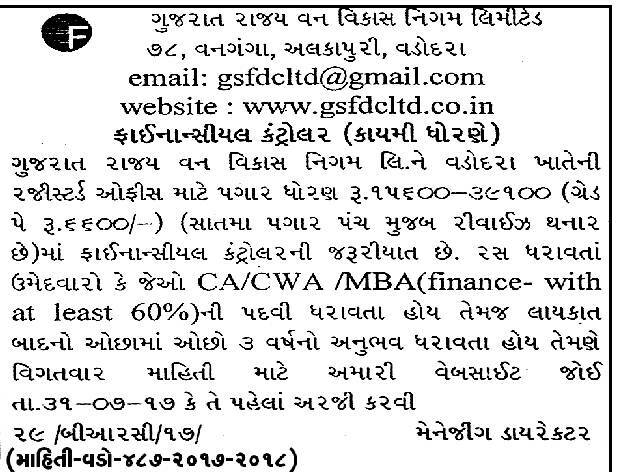 favour of "Gujarat State Forest Development Corporation Ltd., " payable at VADODARA. (Application without application fee will not be considered). How to Apply: Interested candidate should apply only in prescribed format given on our website on or before 31-7-2017. Application along with required documents to be sent by post/ courier. Only eligible candidate should apply. Address to sent Applications: The Managing Director, Gujarat State Forest Development Corporation Ltd., “Vanganga”, 78, Alkapuri, Vadodara – 390 007.